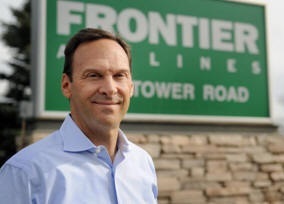 May 14, 2015 - On Wednesday Denver's low-cost airline, Frontier Airlines CEO Dave Siegel steps down, he will be replaced by the carrier's chairman and president. This comes just after the DOT’s Aviation Consumer Protection Division reported the carriers complaint rate and on-time performance was one of the poorest of the 14 leading airlines. Bill Franke, Frontiers Chairman will oversee strategy and finances and Barry Biffle, President will manage strategy and finances. Frontier Airlines has reported Siegel stepped down for personal reasons. Biffle said "We are 100 percent behind having the lowest costs in our space. But low cost does not mean a bad experience. We want to offer low fares and reliable service." JD Power's 2015 North American Airline Satisfaction study ranked the carrier the poorest of the six carriers listed. Frontier Airlines reported one of the reasons for a poor showing was due to a new reservations system that left callers on hold for a long period of time. The carrier has reported that they have taken strong measures to correct flight delays and complaints through news policies, trainings, hiring more personnel, changing flight schedules, etc. The company also reported the carrier will install lightweight seats on its aircraft to reduce fuel costs. Back in April 2014, Siegel had changed the companies business model to ultra-low-cost-carrier (ULCC) in an effort to increase profits. Siegel said "Those were the Dark Ages, this is the Renaissance. We started pursuing the ULCC model 2½ years ago, but we had an owner that didn't really understand the model and didn't want to make any investments. Now we have Indigo and they understand the model better than anyone else in the industry, and they are willing to make smart investments." The company basically went from all services included in the price of a ticket to charging mostly everything separately, such as luggage, seating next to a window, etc. Siegel said "We are basically reducing the fare and then will charge for everything else the customer may want a la carte." The resultant of this ULCC model appears to have turned customers away and a resultant of the companies poor ratings.